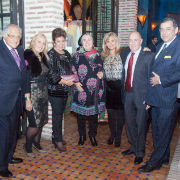 From left: Rafael Cohen, Honorary Consul of Israel in Andalucía; Marie Noelle Erize, Secretary of Spanish Friends; Isaac Querub, Co-President Spanish Friends; Ms. Shirley Kutner; Ambassador Daniel Kutner; Remedios del Rio, Governor and Vice President of Spanish Friends; Dr. Yoav Tenembaum; Governor Astrid Misrahi; VP for Resource Development Amos Elad; Patricia Nahmad, Co-President Spanish Friends; Friends member Elena Ohayon; and Spanish journalist Felipe Sahagun. Spanish Friends of Tel Aviv University hosted a conference in the exclusive surroundings of the Villa Magna Hotel in Madrid. Speaking to over 100 guests from the Jewish community were TAU’s Prof. Yoav Tenembaum of the Diplomacy Studies Program of the Gershon H. Gordon Faculty of Social Sciences; Israeli Ambassador to Spain, Daniel Kutner; and moderator Felipe Sahagún, a prominent Spanish journalist with expertise in international policy. The discussion centered on the role of intercultural communications in international diplomacy. Prof. Tenembaum described issues that arise in communication between parties from diverse backgrounds and cultures. 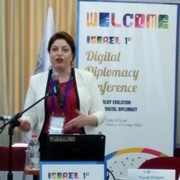 TAU Vice President of Resource and Development Amos Elad, talked about some of the ongoing research taking place at the University and its positive influence on both Israeli society and the international community.